A Pentax K-x DSLR was placed at the prime focus of an f/4.5 Bresser Messier-AR-102-AS ED refractor mounted on a Skywatcher AZ, GOTO mount. 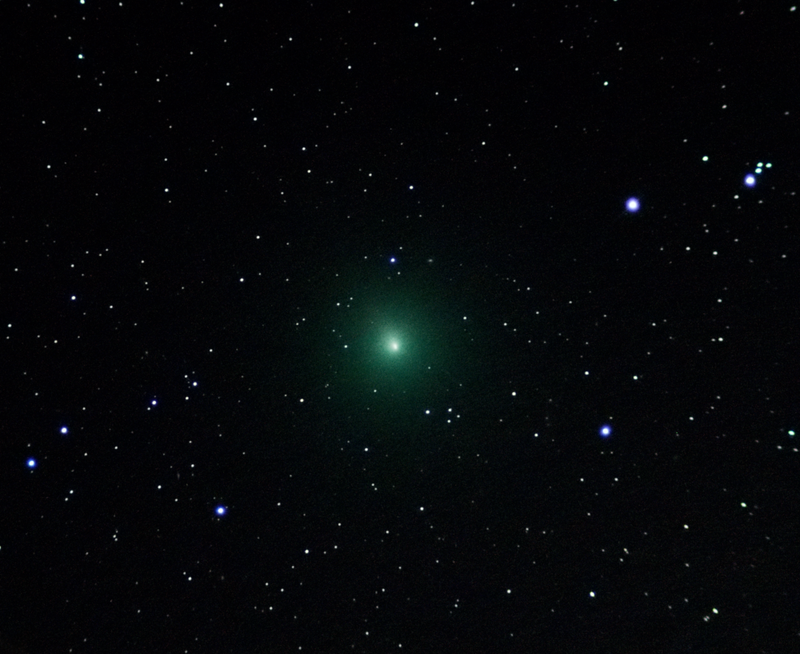 20 x 15s exposures were captured of Comet 46P/Wirtanen at ISO 12800 as RAW files. Dark frames and flat fields were also captured. The 19 best images were stacked in Deep Sky Stacker running in Wine on an Xubuntu laptop with dark frame and flat field calibration. The image was post processed in The Gimp 2.10 and FastStone running in Wine, and Neat image. The Comet has a very large coma with low surface brightness. It was easy to see in 15 x 70 binoculars but very hard in 10 x 50s as it was low in the sky and in the zone of light pollution visible over the mountain. In a few days, when it gets into the higher, blacker sky, it should be easier to see.